The unit cost of an item is the total cost of producing a unit of a product including the variable and fixed cost components of producing the item although businesses can include some or all storage and warehousing cost components in the unit cost depending on the nature of the product, business and operations. The unit cost is usually further broken down to understand the major input costs and the split between variable and fixed costs in producing the product. When only the variable costs of production are included it is referred to the marginal cost of production. The Variable costs are usually composed of the raw materials and other inputs that would only be consumed if the decision to make that unit of production is taken such as energy and packaging costs. At times unit costs can't be measured accurately due to the nature of the inputs such as volatile energy costs or material costs, transport costs, plant performance, and waste levels. When coming across an estimate for unit costs it is important to understand the assumptions on which the input costs that make up the unit cost are based on. 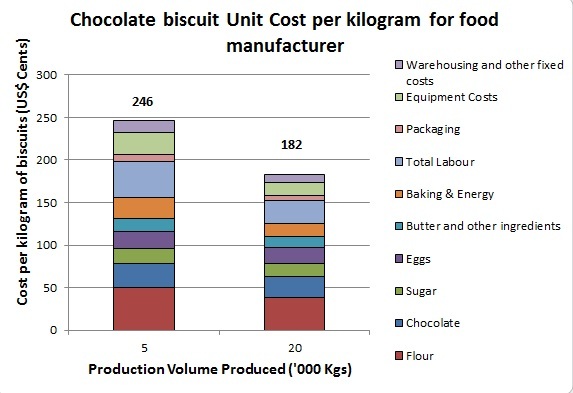 The following is an example of the composition of the Unit cost for a food manufacturer to produce chocolate biscuits. In this example both variable and fixed costs of production have been included in the calculation of unit cost for different production volumes. The unit cost for chocolate biscuits is shown below for two different production volumes to show the effect of economies of scale have on the unit cost. Unit costs are usually used in graphing the cost curves of a production facility depicting the different unit costs for different production volumes. Cost curves are usually graphed together for different production facilities or competitors producing the same product in order to analyse cost competitiveness among competitor plants. 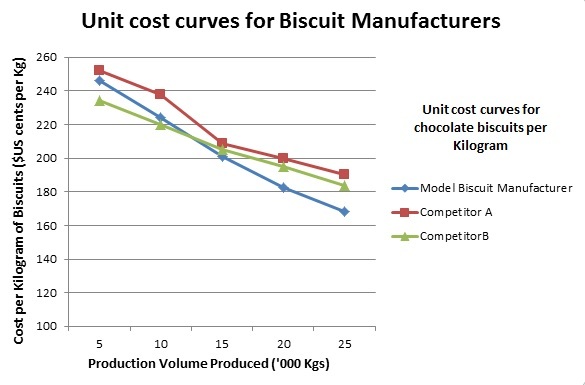 The graph above follows on from the example in figure 1 depicting the cost curves for a food manufacturer producing chocolate biscuits and two other competitors producing the same or similar product. The food manufacturer in figure 1 is labelled Model biscuit Manufacturer.